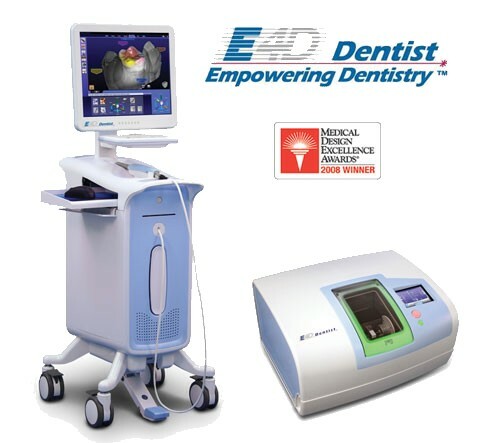 The E4D system is a state-of-the-art digital scanner, virtual design center, and a milling unit capable of fabricating esthetic and strong porcelain restorations. This system provides us with the capability of delivering same day porcelain crowns, veneers, inlays and onlays to you using the latest in technology and clinically proven materials. In contrast to conventional porcelain restorations, which take two appointments to restore a single tooth, the E4D system enables us to scan your tooth, virtually design the final restoration, and mill your metal-free restoration with precision. This eliminates the need to wear a temporary for weeks and come back for a second appointment. Conventional methods of placing single crowns usually require two appointments. During the first one, the dentist will usually prepare the tooth, get the information necessary to make the final restoration (impression) and then put on a temporary restoration. A temporary that you might have to wear sometimes up to four weeks or more. During that time lots of things can happen to your tooth; it can shift position, it can become more sensitive, or unsupported areas can be more susceptible to breaking during this period. With the new E4D Dentist System your dental professional can often provide you with a same day solution, providing you more convenience and eliminating the waiting period where only bad things can happen to your 'temporary' crown and tooth. Same-day dentistry is healthier dentistry. Ask us if E4D and Same Day Dentistry is right for you.